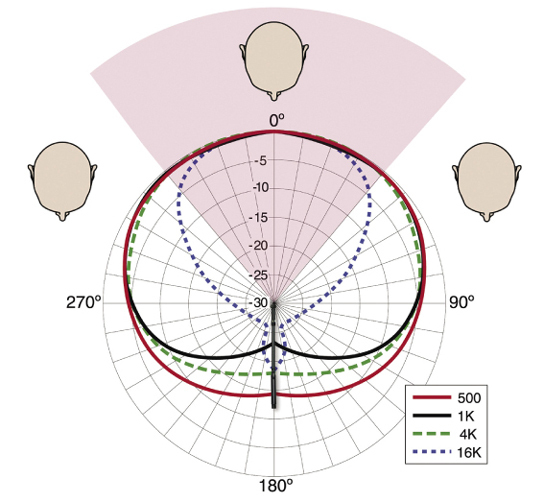 The polar response of conventional microphones is typically very poor, as they have significant losses of high frequencies at the sides of the microphone. Ever try to put three singers on a single mic? Earthworks near-perfect polar response does not lose high frequencies at the sides of the microphone, so you can put three singers or orators on an Earthworks microphone with excellent results. During a meeting or church service you have probably noticed that when orators are speaking directly in front of the podium microphone, they are easily understood. As soon as they move to the side of the microphone their voices sound quieter with deteriorating sound quality. When they move back in front of the microphone they sound louder with much better sound quality. The reduction of sound quality is due to lack of high frequencies at the side of the microphone. Notice when the orator is speaking at the side of the microphone, the high frequencies (i.e. dotted blue line) indicate a nearly 20dB reduction in sound level as compared to speaking at the front of the microphone. Earthworks High Definition Microphones use a new technology that prevents a loss of high frequencies at the sides of a microphone. An Earthworks directional microphone offers the full frequency response and full level at both the sides and front of the microphone. When orators use an Earthworks High Definition Microphone they enjoy the same high quality sound and sound level at the front or on the sides of the microphone. The diagram above shows how the high frequencies have no loss of level on the sides of the microphone (shown with the blue dotted line). The green shaded area offers the full uniform frequency range of the microphone and everyone sounds wonderful. Notice in the Conventional Microphone polar graphic, the narrow usable portion of the polar response only provides a narrow window in which it can pick up sounds with full frequency response (due to the high frequency losses at the sides). In Figure 10 you will see an 80-voice choir miked with conventional microphones. It takes 6 conventional microphones, placed 6 feet in front of the choir, to adequately cover the choir with the full frequency response of the microphones. In contrast, the much wider polar response (with full frequency response) of Earthworks High Definition Microphones allows the use of fewer microphones. With Earthworks High Definition Microphones, you can not only use fewer microphones, you also have more sound level before feedback, no spotlighting or highlighting, more rejection of sounds from the rear in addition to a vastly superior sound quality. 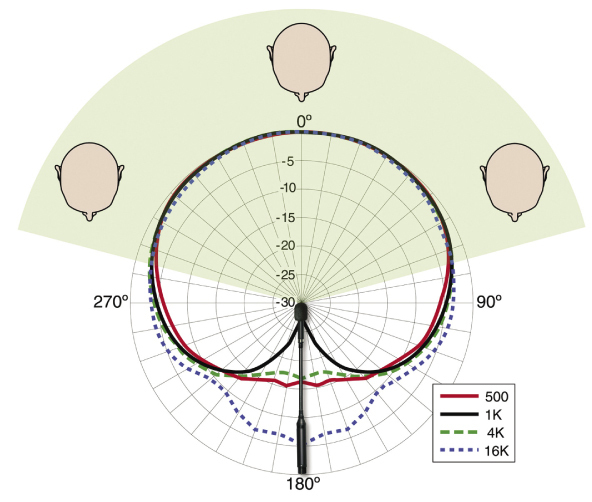 Figure 11 illustrates how the same 80-voice choir is covered fully with only 3 Earthworks High Definition Microphones because of their wider pick-up pattern and utilizing the full frequency response of the microphones.